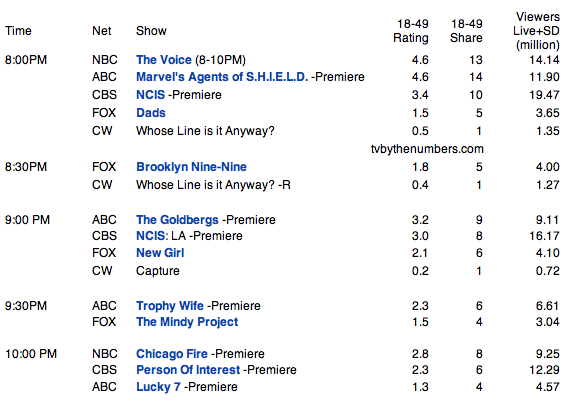 The numbers are in and The Voice comes out on top for the Tuesday night premiere tying for 1st place with Marvel's Agents of S.H.I.E.L.D. while still pulling in more viewers! On NBC, The Voice earned a 4.6, down from yesterday's colossal 5.1 adults 18-49 rating, but up from last fall's Tuesday debut (which earned a 4.0 adults 18-49 rating). Aguilera Online™ claims absolutely no affiliation, or partnership with Christina Aguilera (Xtina), RCA, Sony BMG, management, etc. All Rights Reserved. Aguilera Online™ is the best fan site on the web for everything Christina Aguilera news, photos, music, music videos, feature films, The Voice, opinions, etc. Enjoy your Stay. Check back frequently! [RUMOR] 'MOVES LIKE JAGGER' MUSIC VIDEO TO FEATURE MOVES BY...MICK JAGGER? [NEWS] CHRISTINA AGUILERA & PITBULL PERFORMING AT THE "KIDS' CHOICE AWARDS"
AGUILERAONLINE. Travel theme. Powered by Blogger.